This fabulous 5 bedroom, 4 bath, furnished luxury log cabin with furniture upgrades is perfectly situated for excellent skiing. It is spacious enough with three master bedroom suites to accommodate large crowds or multiple families in luxury. The unit has a "turn around" driveway for easy access in the worst of weather. The garage includes ski racks and cubbies for all ski apparel. Big screen TV, DVD player, wet bar, and the bunk beds consist of two stacked queen sized beds. Approximately 3,334 square feet of luxury! Many forms of entertainment surround the cabin, from the ski-in/ski-out access, to mountain biking, hiking, fishing, and rafting to the relaxing private hot tub. This cabin offers something for everyone! 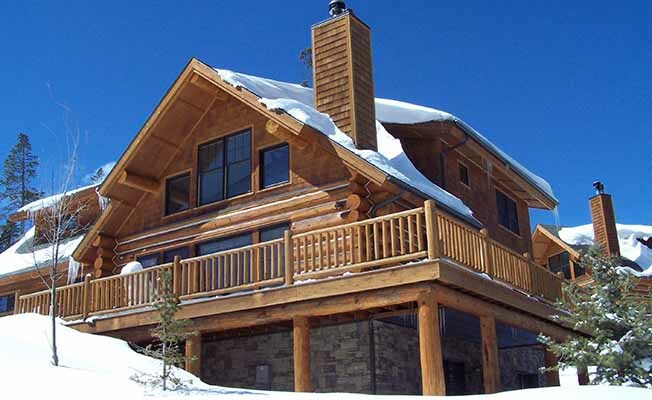 This ski-in/ski-out log cabin located in Big Sky, in the beautiful mountains of Montana is 45 minutes from the West entrance to Yellowstone National Park and five minutes from fly fishing in the Gallatin River. Excellent location for summer and winter vacationing.